I want to tell you something very personal, actually your breath stink! Oh no, I am sure if you tell this to your friend it will be very embarrassing to him or her. So how can you hint or tell your friends that they have bad breath or stained teeth without hurting their ego or making them feel embarrassed? Well, perhaps you can send them info card, messages, video or the latest Facebook app video to hint and remind them about Oral Hygiene and start Rethink Your Mouth. As you know we Malaysian love our food, some of the local delicacies and favourite food are quite pungent such as sambal petai, tempoyak, belacan, asam laksa, budu, petis udang and cincaluk. Plus some of us like fresh garlic and onion or even durian. Can you imagine your breath and you talking to someone after you ate all those food. OMG! Please keep a distance from me. As you know I love to eat asam laksa with lots of petis udang (prawn paste) and drink black coffee. So, do you want to talk to me and can you smell my fishy breath and see my yellow stained teeth. Eeeewwww no way, to me oral hygiene is very important that is why I am proud to show my sparkling teeth and signature sunshine smiles. Plus I always gargle and if possible brush my teeth after meals. Remember to brush your teeth every morning and before you go to bed, if you can practice brushing your teeth after meal then it’s a bonus. I am using this new Oral-B Pro-Health Clinical Pro-Flex Toothbrush. It has soft and flexible bristle brush that works gently on my gums at the same time effectively reach out to the back and every corner to remove up to 93% of hard-to-reach plaque. How many of us actually floss our teeth regularly? Well, I floss every night after I brush my teeth. Plus I always carry Oral-B Pro-Health Deep Clean Floss in my handbag, sometimes food stuck in between my teeth despite I tried to gargle and it still there. 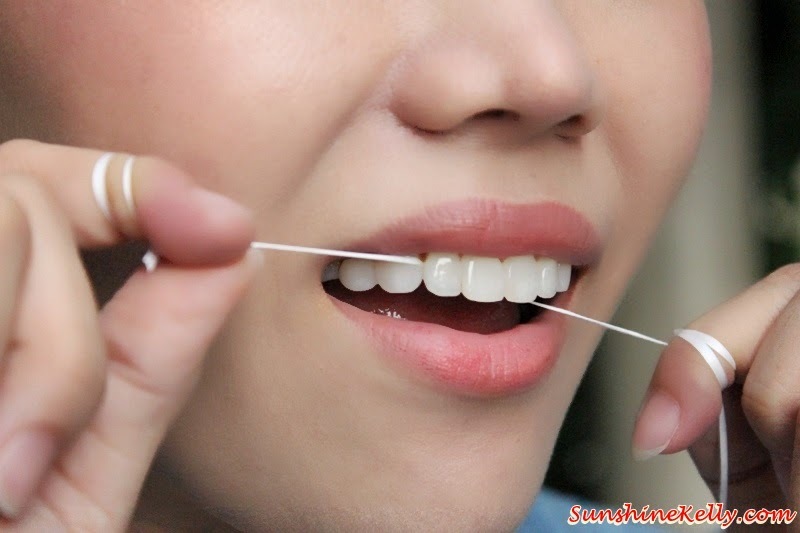 It very irritating so dental floss is the best help, please do not use fingers to dig and pull out, it is dirty. I like the Oral-B Pro-Health Floss cool mint. It gives a refreshing and minty feels. If possible after eating all the pungent food that I mentioned earlier the best thing to do is gargle your mouth with Oral-B Pro-Health Tooth & Gum Care Mouth Rinse. Not only that I gargle every morning and evening too. The Oral B Oral-B Pro-Health Tooth & Gum care Mouth Rinse keep my breath fresh and protects my teeth all day. Oral B Oral-B Pro-Health Tooth & Gum care Mouth With its 2-in-1 action, fights cavities, freshens breath and its alcohol free formula is suitable for everyone especially those with sensitive mouth and gum. The mouth rinse also contains Cetyl-pyridinium Chloride, a clinical proven ingredient to help reduce plaque formation. However many of us forgot or take it lightly when it comes to our oral hygiene. How about you? When we meet someone, the first thing they look at us is our face and when we smile the next minute they will focus on our teeth. The moment we start talking and if we have bad breath it will turn people off and it’s so annoying. So remember to keep out breath fresh and clean all the time. If you don't take care of your oral health it can actually lead to other health problems also. Now please go and stand in front of the mirror, smile and open your mouth wide please look carefully at your teeth plus don’t forget to check your breath. You pass or fail? hi. I'm a Year 2 dental student.Well, you are right it's a must to brush your teeth at least twice a day to prevent caries and is advisable to brush after meal. Flossing is encouraged too. But one thing is I don't really encourage to gargle so frequently like what you said to gargle with mouthwash every meals(even every morning and evening),seriuosly it's really over gargle already. Because mouth wash contains Clorhexidine that might have some adverse effects you can just try to google it out. I would recommend to gargle using water after meal is more than enough as it contains fluoride to prevent caries. Drink lots of water also a way to prevent caries. And remember,it is not advisable to use mouthwash just right after you brushed your teeth,wait for at least 20-30 minutes,it's an important tips on how to use a mouthwash correctly. Just to pinpoint it out so that you can increase your oral healthcare awareness not to offend you. Cheers. Kelly have you tried oil pulling? I am seeing a lot of positive feedback about it, and I am trying to incorporate it into my oral care routine myself. If you'd rather not be worried building your own convenient oral kit, you can buy one of the pre-packaged packages that are from the commercial perspective available. They contain the same kinds of items as convenient oral packages you put together yourself, but you'll pay more for the comfort.